← Wood v Oil: The End-Game For Fossil-Based Plastics ? This presentation was first given at a Bristol ‘Communicate/ Thinking Beyond Plastic’ Conference in June 2018. 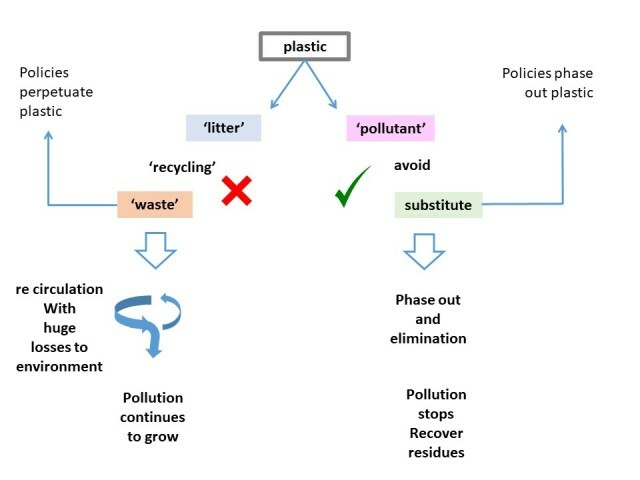 It summarizes the development of the “plastics issue” and argues that the relevant ie effective and evidence-based framing is of plastic as a pollutant, not litter or recyclable ‘waste’. Continuing to see plastics through a ‘waste management’ frame will simply guarantee the continued stream of plastic pollution arising from plastic production. The September 2018 blog Wood v Oil argues that ‘cellulosics’ could pose the end-game for fossil fuel plastic. The emergence of a ‘solution industry’ can be expected to promote the salience of plastic pollution as it becomes more clearly avoidable, and should be used to leverage policy change to eliminate rather than manage fossil-plastic.